You reported acute joint pain in your knees. Doctors after careful observation confirmed it as Osteoarthritis (OA). OA is the most common form of arthritis or disease of the joints. It is a chronic (long-term), degenerative disease that causes the breakdown of cartilage in the joints. OA is often described as age-related 'wear and tear' and the prevalence of OA increases as we age. Hips, knees, and the small hand joints are most commonly affected joints but any synovial joint can develop OA. Joint tissues including bone, cartilage, capsule, ligaments and muscle are affected. Maintaining a healthy body weight. Fig.1. Representation of an osteoarthritic knee joint. 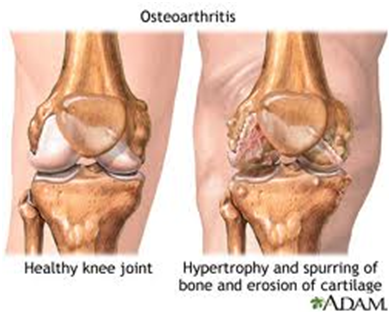 Pain is the most common symptom of osteoarthritis. It is usually made worse by placing weight on it, and it is usually relieved by rest. As the condition progresses and inflammation develops, pain may become constant. 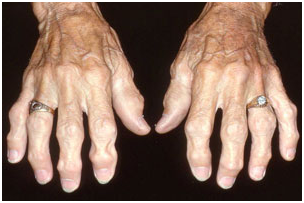 Deformity can occur with osteoarthritis due to bone growths and cartilage loss. Bone growths can occur in the end or middle joints of the fingers. Degeneration of knee cartilage can result in the outward curvature of knees (bow-leggedness). Exercise can assist with weight loss, the maintenance of muscle strength and the mobility of arthritic joints. 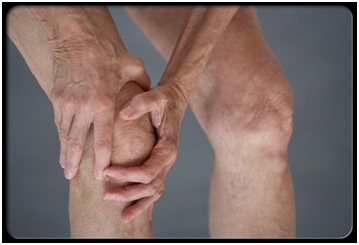 Activity at a level that does not cause pain is not thought to worsen osteoarthritis. It's very important to keep your joints moving. You'll need to find the right balance between rest and exercise - too much activity may increase your pain but too little can make your joints stiffen up. Little and often is usually the best approach. Non weight-bearing exercises such as swimming or aqua jogging in a heated pool may be beneficial. Exercise every day. Do exercise you like and you are more likely to do it, even if this is only a short walk. Exercise is good for your general well-being (heart and lungs), your mood, your joints and muscles, your balance and your bone health. Pace your activities (doing small bits often or taking the middle road) rather than overdoing or under doing. 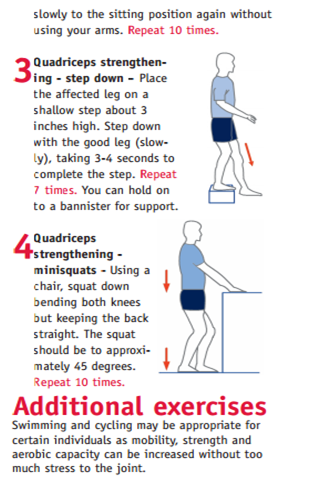 Try and use normal movement for everyday activities like lifting, sitting, standing, bending and reaching. When you have pain, sometimes you forget how to move normally or you overprotect the joints. This can make functioning normally difficult and can make the pain worse. Good posture can help reduce pain and improve function: gentle stretching and relaxation are often useful options here and changing positions frequently rather than staying in the one position for extended periods. Modifications of everyday equipment can reduce stress on joints: a good example is raising the height of a chair to make standing and sitting easier, or using a smaller saucepan for cooking that is not so heavy to avoid joint strain. Planning your work and social activities ahead to help you think about ways you can better manage challenging situations or pain flares. Asking your family or friends to help where possible can help both you and help them to understand your pain experience. Weight Management Maintaining an Ideal Weight is crucial as obesity is a big risk factor leading to other complications. Even losing 2 kilos can lessen stress. Calculate your Body Mass Index (BMI) here and aim to keep it below 23. Physical Activity Exercise is the key to keep your joints flexible, strong and avoid stiffening. Physical activity will also assist with weight and pain management. Consult with your doctor or physiotherapist before you begin exercising. Choose mild to moderate intensity workouts with emphasis on strength training, stretching and aerobic exercises. Occupational Stress Assess if there are any factors contributing towards the physical stress of the joints. Ergonomic solutions can help and reduce repetitive work that can increase pain. Alcohol Abstinence is the best policy Alcohol is high in calories and can cause inflammation. Drink in moderation or completely eliminate it. For the best advice, please contact your doctor. Pain Management and other Techniques Stress can increase pain. Indiscriminate use of over the counter pain killers should be avoided as this can lead to side effects. Incorporate a daily routine to relax and rejuvenate - try to listen to soothing music, chant, read a book or meditate. Yoga, tai chi can help. Other techniques such as hot and cold packs, acupressure, massage, breathing exercises can help manage pain. 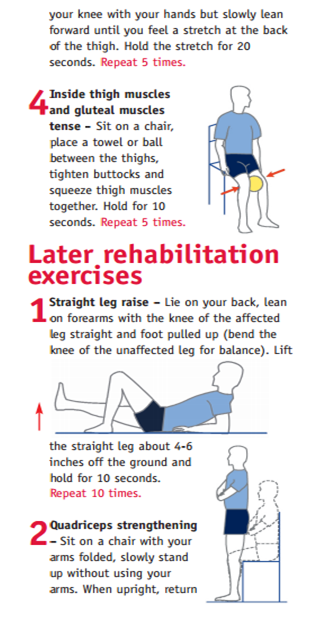 Consult your physiotherapist for other exercises that can help with pain and improve joint stability. Caffeine Limit intake of tea, coffee, colas and chocolate to only 1 Cup a day. Lowered caffeine intake is known to induce a better sleep and lessen pain. Take the medicines on a full stomach and incorporate 6-7 small meals/day instead of just 3 heavy meals. 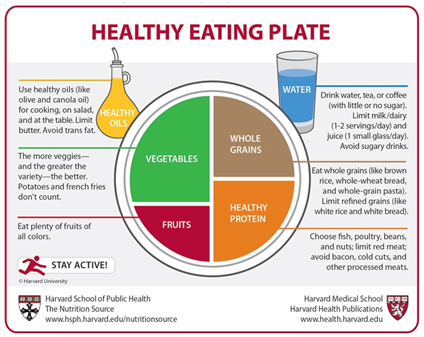 The Healthy Plate below shows what foods should feature in a daily diet. Weight is one of the biggest factors in preventing and treating OA. One study found that obese women who lost just 11 pounds cut their risk for knee OA in half. Try cutting calories by taking smaller portions, avoiding sugary foods and drinks, and eating mostly plant-based foods. Fruits and vegetables are always a healthy food choice. And as a bonus, many are loaded with antioxidants. These are substances that can help protect your cells from damage. Some antioxidants -- such as those found in apples, onions, shallots, and strawberries - may also help reduce joint inflammation. This may help ease the pain of arthritis. Omega-3 fatty acids can help relieve joint pain and decrease morning stiffness. They work by reducing inflammation in the body. One easy way to add omega-3s to your diet is by having two servings of fish each week. Some of the best sources are trout, salmon, mackerel, herring, tuna, and sardines. One study found that a compound in olive oil, helps prevent inflammation. About 3 1/2 tablespoons of olive oil offers the same relief as 200 mg of ibuprofen. However that much oil also gives you about 400 calories. To add olive oil to your diet without adding extra calories, try using it in place of other fats, such as butter. Eating foods rich in vitamin C is a great way to add this nutrient to your diet. Citrus fruits, red peppers, strawberries, broccoli, cabbage, and kale are all good sources. Aim for the recommended daily amount of 75 mg a day for women or 90 mg a day for men. Do not add SALT or SUGAR to any food or beverages. For cooking, use only Olive oil or Peanut oil. Add 2 servings of fish each week if possible. Vitamin D As healing advances either fortified foods (milk, cereal), supplement or a 30-minute sun exposure to boost Vitamin D absorption can prove beneficial for bone health. Vitamin E and Vitamin B3 Assists with healing and lessens joint inflammation and damage. Glucosamine Chondroitin and S-adenosylmethionine (SAMe), Can be tried for 3 months to assess any benefits. If any, then can be continued for a longer time. Maintain a balanced diet and perform supervised physical activity. Avoid foods high sugar content. Increase vitamin C, D, E, A and B3 food sources to reduce inflammation and boost recovery. Quit smoking and do not drink. Eat Right and Exercise your way to a Healthy Body.